Autism Spectrum Disorder or ASD begins before the age of three and lasts for a lifetime although the symptoms may improve over a passage of time. Autism spectrum disorders are complex disorder of the brain and its functions which can affect every individual differently. Those suffering from autism spectrum disorder may show signs of future problems within the first few months of their life while others may show up later than twenty four months. Some children with this disorder grow normally till the eighteen or twenty four months of age and thereafter stop gaining new skills or may also lose the skills they have developed. It can affect the child’s ability of signs of impaired social interaction, problems with nonverbal and verbal communication with unusual or limited interest and activities. The three areas of a child’s life that get affected at the time of autism spectrum disorders are behavior and interests, social interaction and communication verbal and non verbal and each person with this disorder have their own pattern of autism disorders. 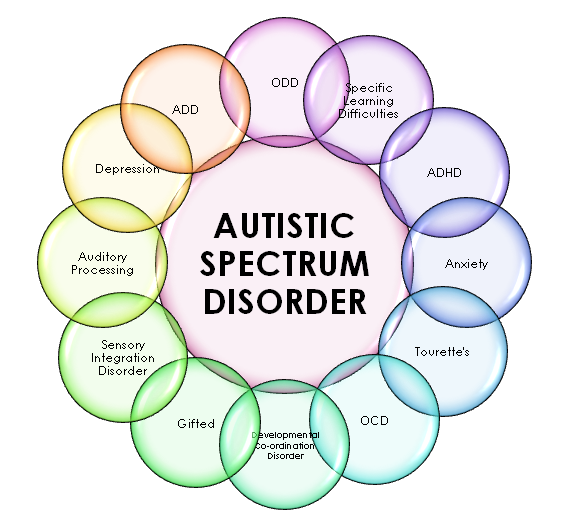 The different types of autism, are, Autistic Disorder also known as classic autism where person with autistic disorder have language delays, communication and social challenges with unusual behavior and interest together and at times intellectual disability. The next is Asperger Syndrome where the person has some milder symptoms of autistic disorder and might have social challenges with unusual behaviors and interests though they do not have problems with the language or intellectual disability. The third is Pervasive Development Disorder – Not Otherwise Specified, (PDD-NOS) also known as atypical autism which to some extent is similar to autistic disorder or Asperger syndrome but not all are diagnosed with this disorder. People with PDD –NOS have less and milder symptoms which might cause social and communication challenges. No two cases of PDD-NOS can be identical in their symptoms and if a child is autistic to the professional evaluator and does not meet all the symptoms for autistic disorder, then the person has PDD-NOS. Rett syndrome is comparatively rare affecting girls and around 10,000, to 15,000 girls may develop this form of autism. The child tends to stop responding socially, between 6 to 18 months of age, losing language skills and wrings hands habitually, with coordination problems which can become severe with the head growth slowing down that can get far below normal by the age of two. The person who meets more rigid symptoms for a diagnosis of autism is said to have autistic disorder and have severe impairments involving social and language problems together with repetitive behaviors. At times they also tend to have mental retardation as well as seizures. Autism spectrum disorder, with timely intervention and diagnosis, can help in improvement in social development and reduction in undesired behavior. It is said autism can affect an estimate of two to six per 1000 children, with males about four times more often than females and early diagnosis is important since an early treatment can help the child to make significant progress in language and social skills. There are early intervention services which help children from early childhood who teach them the important skills including therapy to enable the child to talk, walk and interact with the other children.